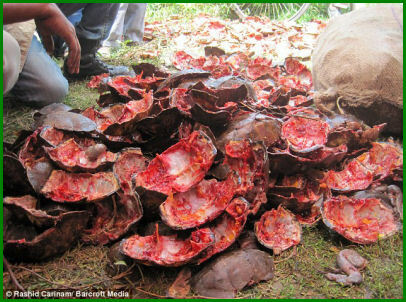 A Hindu festival that celebrates light has been shrouded in darkness following the sacrificial slaughter of up to 100,000 turtles. Shown in these horrifying images, critically endangered species including the northern river terrapin and the black soft-shell turtle, are sacrificed in the name of religion. The ancient ritual takes place during the celebration of Kali Puja, which started in Bengal yesterday. Held once a year, and corresponding with the festival Diwali, sacrifices are made to Kali, the Hindu goddess of power. 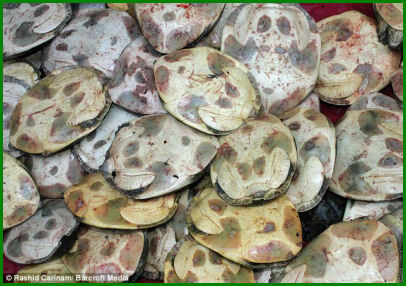 During Kali Puja, market streets are teeming with devotees who purchase and consume thousands of turtles. 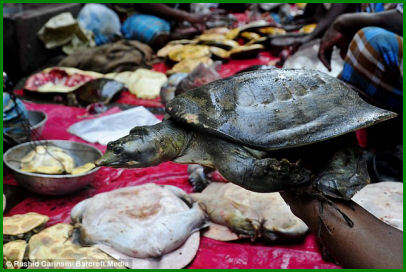 One of the species found on Dhaka's markets is the northern river terrapin. Around 25 individuals are known to exist, making it one of the rarest animals on earth. On paper it is offered the same level of protection as a tiger. Another targeted species is the black soft-shell, which has only recently been officially been found in the wild and it has a single population in a pond in the region of Chittagong. Even though many of the turtles are critically endangered and feature on Schedule 1 of the Indian Wildlife Protection Act, the slaughter is often overlooked by authorities. The act has enraged conservation groups in India and abroad. "Since the killing of turtles was made illegal, this mass slaughter has been carried out in the name of 'religion'," said Dr Rashid of Centre for Advanced Research in Natural Resources & Management (CARINAM) in Bangladesh.+'It's because of this that the authorities turn a blind eye - they are too scared of causing social unrest." 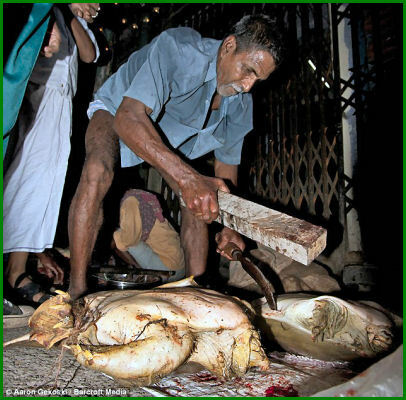 At Dhaka's Tanti Market, the turtles are butchered and their meat, limbs and organs are then sold to customers. The meat sells for between $10 - $60 per kilo (£6-£37), depending on the species. 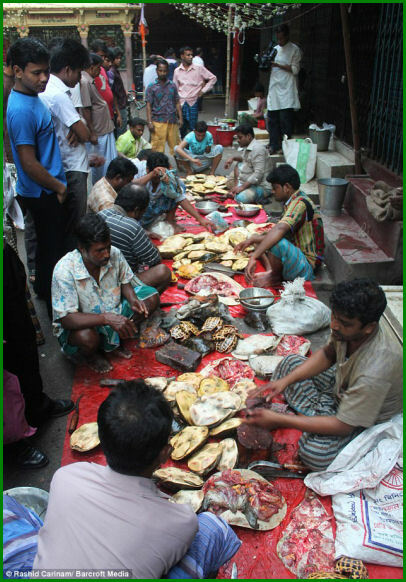 Followers believe that by eating the turtle, they will take on its strength and longevity.During festival, the majority of Bangladesh's Hindu population consume turtle meat. Businessman Sunil Kumar Bala commented: "We have been eating turtles during Kali Puja for a long time. It is a tradition that we will maintain even if the government tries to stop us." The turtle trade offers a source of income to up to 30,000 people. 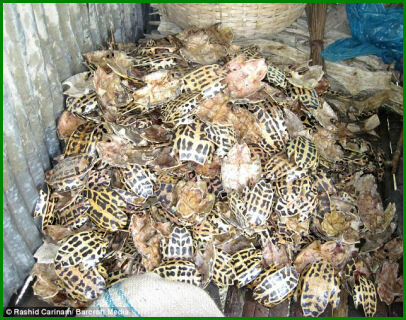 Hari, the longest serving trader of turtles in Dhaka's markets, estimates he has been responsible for killing around 20,000 tons of turtles. "If this this trade stops, many people's livelihoods will suffer," he said. "I have been doing this for the last 40 years, if you stop this now, what will I do?" Turtle conservationists, however, are up in arms. "The Kali Puja turtle market is a wildlife travesty of the worst kind," said Rick Hudson of the Turtle Survival Alliance (TSA) in Fort Worth, US. "The brutality with which turtles are slaughtered is gruesome, shocking and an abomination of nature." Once the market concludes, the shells are cleaned, scraped of meat and then dried. The dried shell has multiple uses. It is processed and fed to fish and chicken. The pharmaceutical industry uses it to make the containers of capsules for antibiotics and other drugs. However, the majority of dried shell is shipped to south east Asia where it is used in traditional medicine. It is believed that consuming turtle shell increases virility. As night fell in Dhaka yesterday, the ceremonies began. During sacrifices to Kali, goats were beheaded and turtles impaled upside down on poles. As they tried to escape, their head and legs were chopped off. Turtles have been on earth for over 220 million years, even surviving K-T boundary that wiped out the dinosaurs. Now they are amongst the world's most endangered animals; around half of their 300+ species are threatened with extinction. "Turtles are being collected, traded, and eaten or otherwise used, in overwhelming numbers." "This situation is completely unsustainable. Unless the trade for turtles stops and a slaughter in the name of religion is regulated, a number of species will be lost forever," said Dr. Rashid.